This is a collaboration between Xyron and Clearsnap. Clearsnap sent the Xyron Design Team $25 worth of goodies from their catalog to create with. 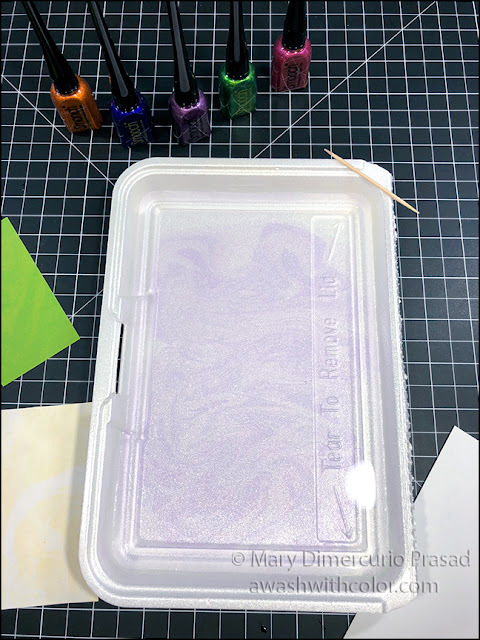 I already own a bunch of ColorBox pigment ink pads and several ColorBox Petal Point pigment ink pads so I decided to try their Smooch Pearlized Accent Ink - a product I had not used before - in 5 different colors (I also received a Cat's Eye pigment ink pad). Smooch Pearlized Accent Inks come in a small container with an applicator attached to the lid. It looks similar to a nail polish bottle, except the applicator is not a brush, instead it has a small pointy ended, slightly flexible tip. The ink has a metallic-like shine, perfect for adding accents to projects. 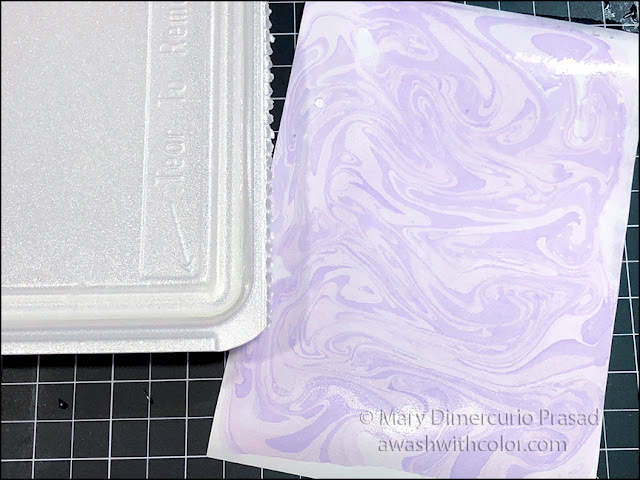 It also works well for making marbled papers. There are a lot of videos on YouTube already but it's so easy that you probably don't need a video. I tried colored cardstock but the inks didn't show up well - I recommend using white or cream colored cardstock. I also tried one color and didn't like it. I recommend using 2 or 3 colors for contrast (you can see my failed attempts to the left of the tray in the photo below). 1. 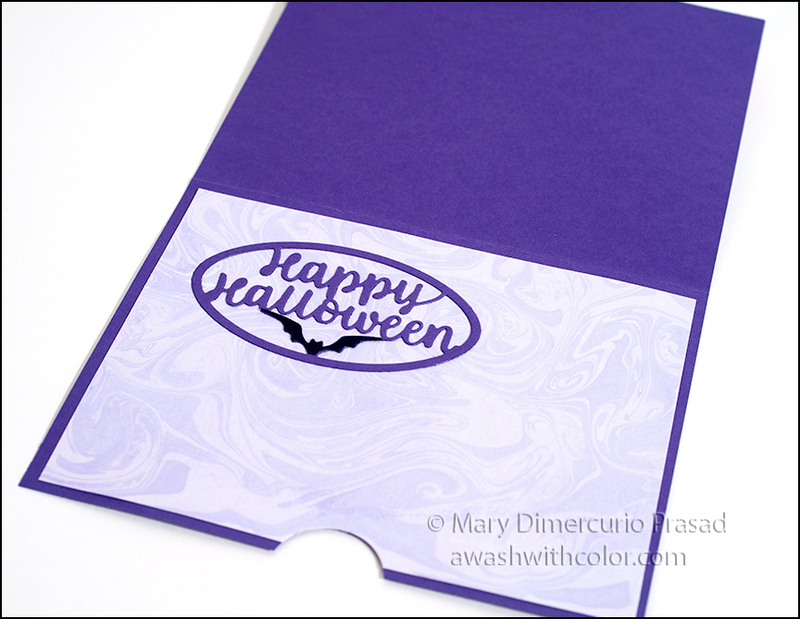 Cut purple cardstock 5 1/2 x 8 1/4 inches; fold in half to form a 4 1/4 x 5 1/2 inch card base. 2. Cut several sheets of white cardstock to about 5x7 inches (I cut mine larger than the card base so I could trim down to the area I liked best). Fill a tray with about 1/2 inch of water; I used the lid from a take-out box. Shake Smooch bottles before using. Tap Dusk around on surface. You may not see it but it will be there. Tap Sugarberry in places. Note: the longer you hold the tip in the water, the more the ink will dispense. Alternate between these colors until the surface is fairly well covered. Tap in alternating rings, one inside another. Once you have the desired coverage (don't overdo it), use a toothpick to gently go through the water in a snaking motion to swirl the colors. Take one of the sheets of cardstock and, starting with one edge, gently but quickly drop the paper onto the surface of the water then pull it back out. Do not touch the paper surface or the ink will smear. Set aside to dry. 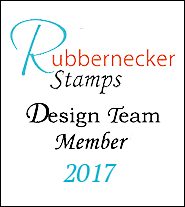 You may want to do a few practice sheets with scrap cardstock. 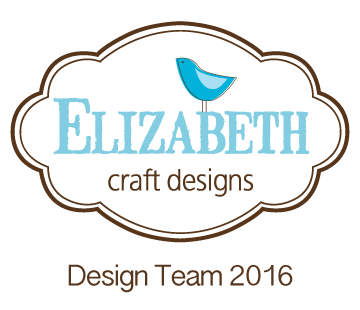 Empty water, wipe tray with paper towel, then repeat until you have about 3 or 4 good designs. Once dry, cut two sheets to 4 x 5 1/4 inches; set these aside for now. Next you'll die cut all the pieces for the card. I recommend watching the video now (step 9) so you know how everything goes together before cutting and assembling. Also hand cut a small white square of cardstock to go behind arrow. 4. See photo below. Cut Happy Halloween oval sentiment with bat (Halloween Charms) from purple cardstock and the bat area from black cardstock. Trim out bat with detail scissors. From the same set, die cut bat charm and spider charm from black cardstock. Add eyes to spider and eyes and mouth to bat with Orchid Frost Smooch ink; add wing lines to bat with Sugarberry Smooch ink (don't use the stencil feature with the die, the ink will likely run under it). Trim charm ring loop from bat. Finally die cut two ghosts from white cardstock. Add eyes and mouth through stencil in die with .25 black Copic Multiliner SP, leaving small triangles of white for highlights (you could also use a white gel pen to add the highlights after coloring). Note: the Copic Multiliner SP versions are refillable so you don't have as much plastic waste going into land fills; you may also change the nibs, although I have yet to do so and have used mine for years. Trim off charm ring loops. 5. From light orange cardstock, die cut pumpkin (Autumn Elements) and Jack-O-Lantern (Halloween Elements) with the face die. From black cardstock also cut a Jack-O-Lantern without the face; you may want to trim it down a little - adhere it behind orange to fill in face. Shade edges and left side using orange ink from Pinwheel Petal Point. 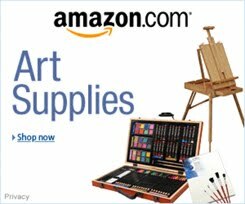 I love these inks - the applicator lets you get into small areas. Use the green ink to color the stems. Use Pumpkin Smooch to draw lines on pumpkins as shown; use Green Apple Smooch on the stems to give them a bit of shine. 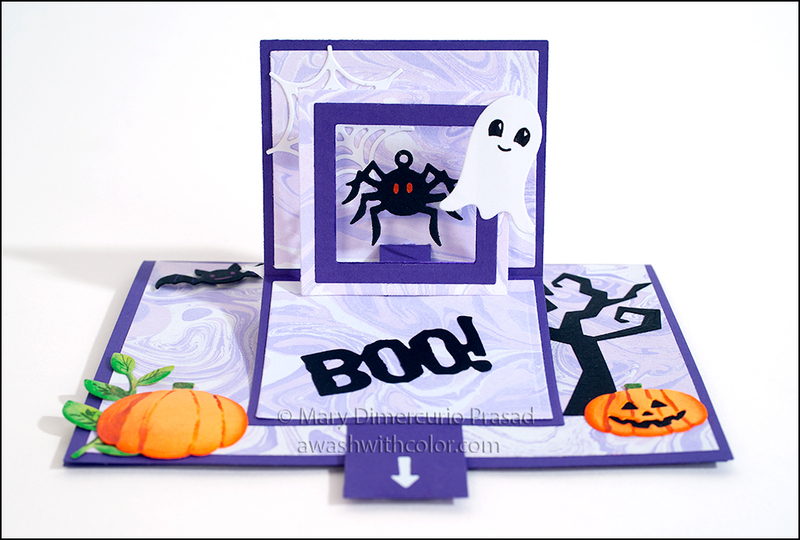 Die cut BOO! 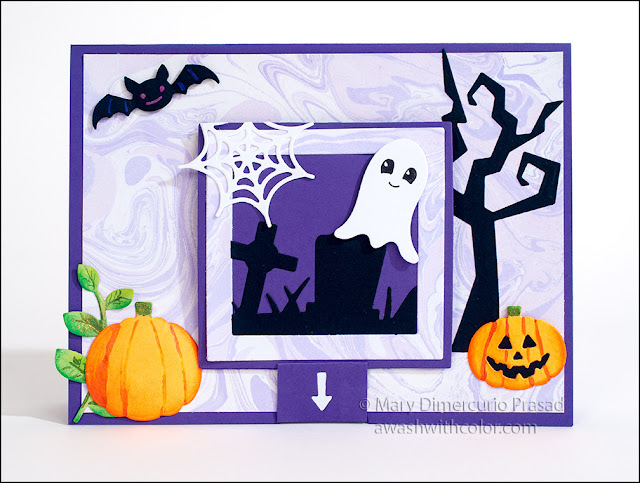 from black cardstock (Halloween Elements). 6. Cut leaves (Autumn Elements) from light green cardstock. To shape leaves, rub backs with ball stylus or end of a paintbrush. Draw lines down front centers using a pointy tip, for example, the end of a die pick. Shade with green from Pinwheel Petal Point. Use Green Apple Smooch for veins in leaves. 7. Using Halloween Scene dies, cut 2 webs from white cardstock. 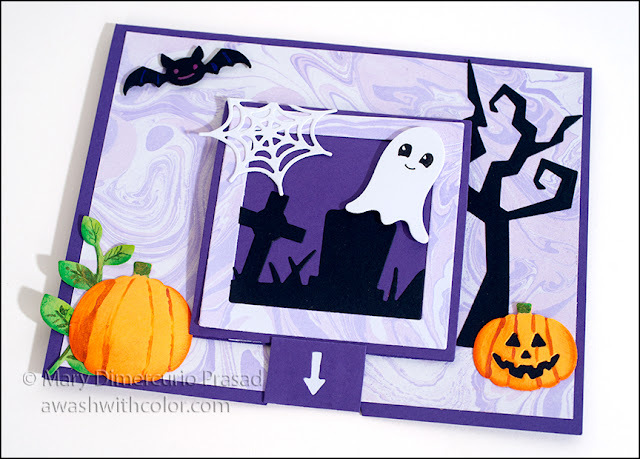 Cut graveyard and spooky tree from black cardstock. Use large frame die (Frame Pull Pop-up ) to die cut the graveyard to fit in the bottom of the marbled frame. 8. 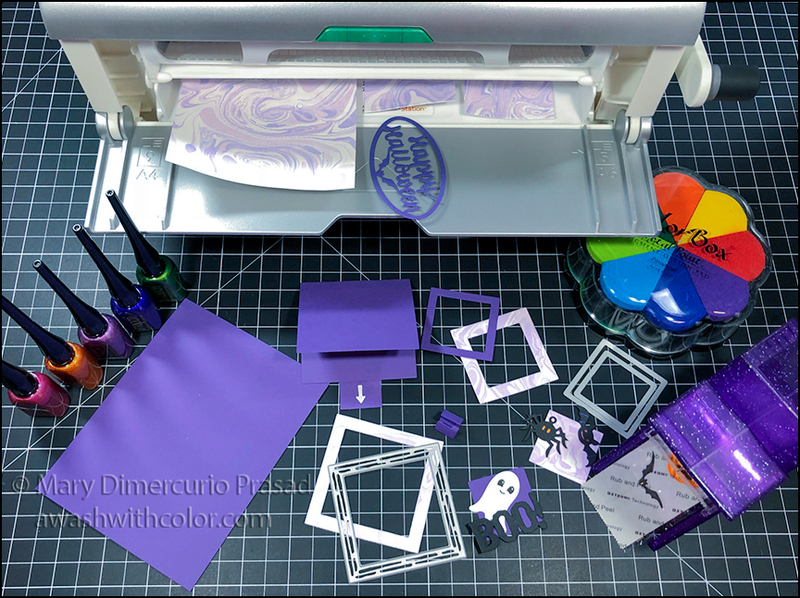 Using the Xyron 9" Creative Station with permanent adhesive, add adhesive to the 4 x 5 1/4 inch marbled rectangles (set aside in step 2), Happy Halloween oval, two big marbled rectangles (for inside the pop up), spooky tree, graveyard, and purple frame (but not marbled frames). Adhere one 4 x 5 1/4 inch marbled rectangle to front of card base and the other inside card base. 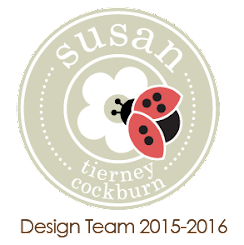 Use 1.5 Inch Sticker Maker to add adhesive to Jack-O-Lantern, one spider web, BOO!, and small bat for sentiment. Adhere bat to sentiment as shown in photo 2 above. 9. Watch the following video for assembly. To repeat, I recommend watching the entire video first then watching again while assembling so you have an idea of how it all goes together before doing it. Assemble the frame pull as shown in video but don't adhere to card front yet - use liquid glue to adhere white square behind arrow during assembly. Adhere marbled rectangles inside frame pull. Decorating continues below, including pop up for inside frame. 10. For front of frame pull, adhere large marbled frame leaving top free as shown in video. Adhere graveyard scene (it should fit perfectly inside bottom). Use liquid glue behind the web without adhesive to glue to frame top as shown - from behind, trim off any part that sticks over the top since it will be opening at that hinge. 11. Cut about 3 inches or so of clear thread to hang spider. Feed through spider's charm ring. Add a dab of liquid glue to inside top edge of small marbled frame (the one that will go on the pop up platform with the spider). While holding up thread, place spider inside frame so it is centered then put the two thread ends in glue. Sandwich with purple frame (it should already have Xyron adhesive on it). Trim off thread ends flush with purple frame. Adhere one of the ghosts to frame such that it overlaps the spider's legs - add glue to spider's legs behind ghost to hold in place (if the spider spins, it will probably get crushed when the frame pull card is closed). 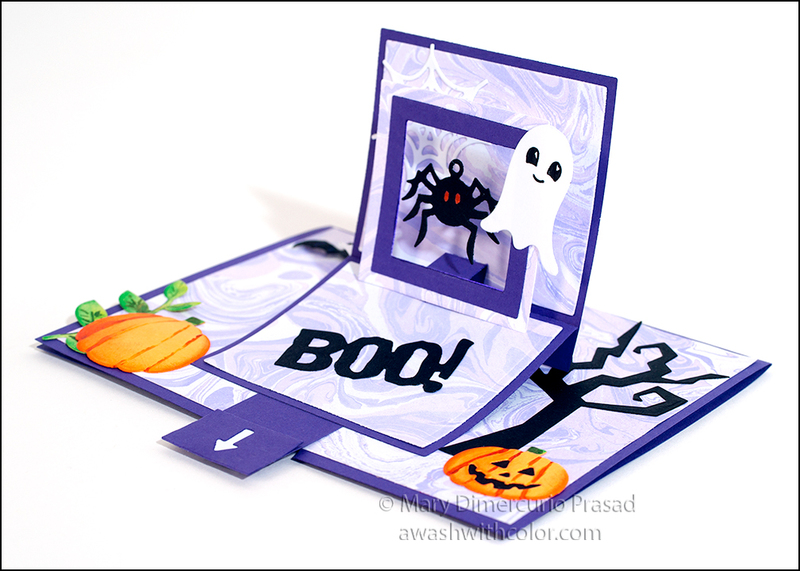 Adhere spider web to inside frame pull card; adhere frame with spider to pop up platform. Adhere BOO! inside frame pull card as shown. 12. 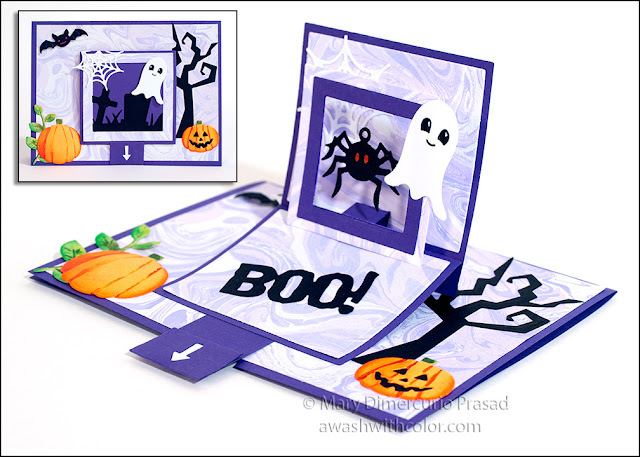 Adhere spooky tree and Jack-O-Lantern where shown on right side of card. 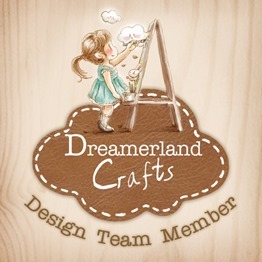 Line up frame pull card on front of card then mark arrow location in pencil as shown in video. Use 1" circle punch to cut tabs. Adhere frame pull to card as shown in video (liquid glue should be strong enough - no need for staples). Use liquid glue down back of leaf stem and adhere where shown. Adhere bat, pumpkin, and ghost to front of card using dimensional tape. * Adhere Happy Halloween oval sentiment inside of card. *To make dimensional tape, run craft foam through Xyron 9" Creative Station with permanent adhesive, peel off clear front sheet, run through again to add adhesive to other side. Follow my blog with Bloglovin so you won't miss any of the marbling fun!